Day after day, robots increasingly become part of the everyday fabric of connected society. They can be found in the factories manufacturing goods shipped around the world to the internet connected homes across the country. As such, it’s never been more crucial to educate people on all the ways robots can be used so that breakthroughs can be made in the field. While the Xpider itself isn’t a revolution in robotics, the diminutive, camera-equipped robot offers those interested a very capable canvas with which to play around and discover more. It comes in two flavors, one equipped with an Arduino processor and the other sporting Intel’s Curie processor. While both versions can be programmed using a simple drag-and-drop app interface or a low-level C language, the Curie version sticks out because of its onboard neural network classifier. This allows Xpider to be trained rather than programmed and offers students and hobbyists another avenue with which to robotics concepts. An Arduino Xpider goes for $109 and the Curie version is $149. Both are slated to ship in February 2017 should their Indiegogo campaign raise $30,000 by November 2016. Most other crowdfunded robots like the ViewBot or the PadBot T1 are designed for security or communication purposes, furthering a more domesticated style of in-home robot. As a sort of blank slate, the Xpider is versatile enough to be whatever a user needs it to be given their talents at programming. 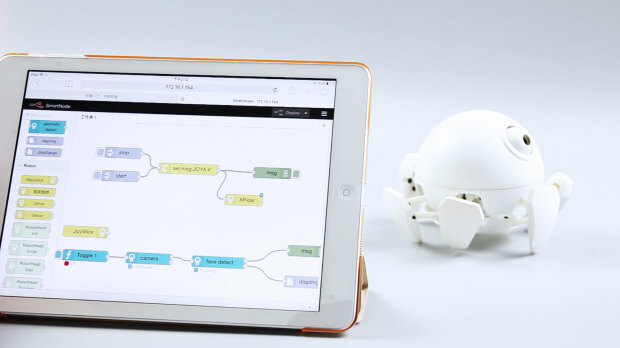 For schools, though, Xpider is a great low-cost way to introduce concepts like neural networks and AI in a very tangible way wrapped up in a customizable spider shell that can charm anyone.